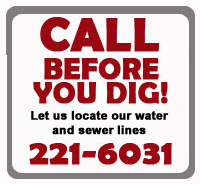 Water Treatment Plant - Jasper Waterworks & Sewer Board, Inc. 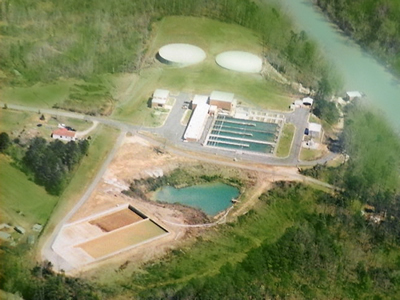 Raw water from Mulberry Fork is pumped to the water treatment plant where it is aerated to prevent taste and odor problems. Chlorine Dioxide is fed in the raw water either at the raw water pumping station or prior to the rapid mix basin as a preoxidant to reduce disinfection by-product formation and to address potential taste and odor issues. Lime is added for ph adjustment and potassium permanganate for aid in organic removal. As water enters the rapid mix chamber alum is added as a coagulant. The water flows through three flocculation basins and three settling basins prior to entering the finishing filters. Chlorine is added after filtration for disinfection, lime and phosphate are added for corrosion control and fluoride for protection of teeth. Finish water is stored in clear wells with a total capacity of 4,785,000 gallons. The water is then pumped from the clear wells to the distribution systems. The Laye-Williams Filter Plant is currently capable of processing 18 million gallons of water per day. The plant capacity is projected to meet the potable water needs of the Board for several years.